The Annapurna Circuit trek is known as the most diverse trek of the world with lush green valleys and fascinating villages that offer impressive snow-capped views of the white Himalayas. The complete circuit of the Annapurna massive an estimated 300km begins from lush sub-tropical forests below 800m in altitude. The scene changes everyday from rice paddies to pine forests to Tibet like country on the northern slopes of the Himalaya in the district of Manang. This is one of the classic and most rewarding treks on the western hills in Nepal offering grand view of the three highest 8000m mountain range Mt. Annapurna I (8091m), Mt. Dhaulagiri I (8167m) and Mt. Manaslu (8163m) including arrays of over 6000m snow capped peaks. Annapurna Circuit trek Starting from less than 1,000 meters, it gives us a chance to explore the Himalayas from bottom to top and from many different angles and perspectives. This three week trek starts right from Besisahar which goes along the Marshyangdi River, with great views of Manaslu and Himal Chuli to the east. This magnificent trek leads you to the fine village, inhabited by a wide diversity of people from different ethnic groups, offering spectacular and majestic views of the Himalayas. Continuing to the north of the main Himalayan range to the high and dry Tibetan Plateau, the scenery is equally breathtaking. 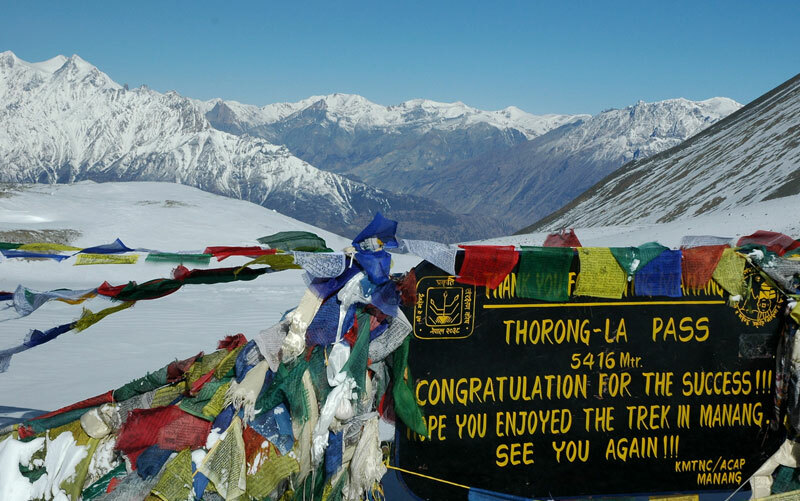 The highest point of the Annapurna Circuit trek is Thorung La pass at the top of the valley at 5416 meters high. Due to the difficulties of crossing the pass, the circuit is usually walked in a counter clockwise direction. Traveling clockwise the longer ascent and shorter descent from west to east is too much for many people to manage in one day. After crossigng Throng la pass we reach at Muktinath the famous Hindu and Buddhist pilgrimage sport the village of the Kali Gandaki – the world’s deepest gorge, passes between the giant Annapurna and Dhaulagiri mountains. After you cross the Thorung La pass from Manang to Muktinath the final seven days of the circuit trek are the same as the Jomsom Trek from Pokhara, but in reverse. Day 1: Arrival at Kathmandu (TIA) and transfer to Hotel. Day 18: Final departure transfer to international airport. Day 1:: Arrival at Kathmandu (TIA) and transfer to Hotel. Day 18:: Final departure transfer to international airport.